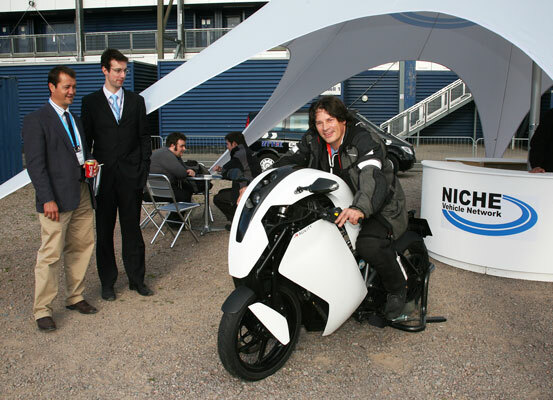 Paul Blezard trying the Hossack-steered, Agni-powered Agility Saietta electric bike for size at the Cenex low carbon vehicle event at Rockingham Circuit in September 2011. Feels less strange than it looks, but it's a shame it's not FF. It would undoubtedly be more comfortable and have better range if it were. This is one of two Agility models due to go on sale in 2012. Photo by Laura Dawson of Agility, with PNB's Canon EOS.